This week, Year 6 have been looking at the secret codes used during WW2. They learnt about Bletchley Park and its role during the war as well as Alan Turing and how he cracked the Enigma code using his 'Bombe' machine. 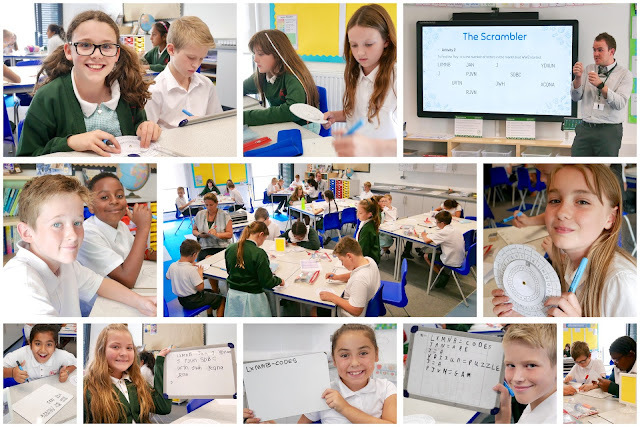 Our own crafty cryptographers created scramblers, which worked on the basis of the Caesar Cipher, and had a go at cracking codes themselves. The children developed their problem solving skills and gained an understanding of how codes can be used to encrypt and decrypt secret messages. It was fascinating fun and Year 6 are looking forward to creating their own ciphers next week.